The Prime Minister of India had urged people to use public transportation rather than personal vehicles during the Global Mobility Seminar held in September 2018. This would require public transportation to be incentivised and private vehicle ownership/usage to be disincentivised. Public bus transportation in Bengaluru is ailing, with the Bengaluru Metropolitan Transportation Corporation (BMTC) seeking Rs 260 crores from the state government to sustain its existing level of services. Currently the BMTC is running on a loss of Rs 10 for every kilometer that it operates. There have been discussions by the Transport Department to propose a bus fare hike. This comes three months after the Department’s proposal to increase the rates of state-run transport corporation by 18 % was struck down by the Chief Minister. The decision to increase the fares comes at a time when it is known that Bengaluru has the highest bus fares compared to other major cities in the country. I had recently written to D C Thammanna, Transport Minister, Government of Karnataka, requesting him not to increase BMTC fares, and to provide an alternate option. What I have written to the Minister and advocate for is the introduction of a Vehicle Area Tax (VATAX) based on the area/ size of the vehicle(in square meters). Dr Vivek Moorthy (Professor- IIM B) has been a strong proponent of this idea and has been writing about it for over a decade. This tax will be calculated based on the area of the vehicle. If the vehicle measures 5 square metres around the edges, and the tax rate is Rs 3,000 per square metre, then the vehicle owner would have to pay Rs 15,000. The rationale behind this form of tax as Professor Moorthy puts it is that car is a mobile land not paid for, unless it is within the owner’s premises. As Professor Moorthy asserts it might be difficult to tax vehicles that have already been bought and registered, as they would have already paid the Lifetime Tax. It would be better to apply the one-time VATAX as a surcharge on new cars. Currently Life Time Road Tax is payable only on the basis of price. VATAX is proposed in addition to the existing Life Time Road Tax. The area of the car is suggested as the criteria because the car owner must pay for the scarce road space occupied by the car. There may be rare cases of cars which are expensive but are not big in terms of area. Since Life time Tax is payable on the overall price of a car, the tax paid on expensive cars is already high. VATAX is suggested on all personal vehicles and taxies. No VATAX is suggested on two-wheelers because the whole idea is to disincentivize purchase of cars. It is a more logical method of calculating Road Tax as it considers the area occupied by a car on the road. It serves the cause of social justice because for bigger cars, higher VATAX is payable. It disincentivises the purchase of bigger cars thereby helping to reduce congestion on the roads. 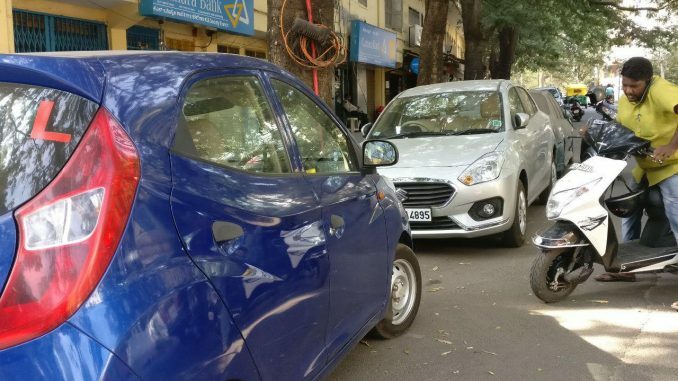 An estimate of the number of new cars for 2019-20 in Bengaluru Metropolitan city is 1,39,994. This is based on an assumption of 10% increase from the previous year (2017-18). Data collected through RTI from a Bengaluru RTO indicates that the weighted average area of a car is 6.26 square meters. If a surcharge of Rs 3,000 per square meters was to be applied on every new car, then the revenue that will be generated would be around Rs 262.90 crores. This form of taxing enables the government to earn revenue which can be diverted for public transportation. The amount generated should be diverted to BMTC which requires approximately the same amount to sustain its existing level of services. To appreciate the revenue potential of VATAX, please see the table below which gives data about the top 10 cars sold in India from January 2018 to November 2018 (Data source: NDTV News), and a sample calculation based on it. Assuming that just 5% more cars of the same make-model are sold in 2019, an amount of about Rs 3,260 crores can be collected as VATAX. Just to emphasize, we are talking of only ten top-selling cars. On all new cars sold in 2019, the amount of VATAX will be huge. In my opinion, the time has come for this rational, socially just tax structure. Note: Arjun Rajan helped in writing this up. @bangaloreminds, if you have a better idea, I would like to hear more about it. Having lived in the west for more than 15 years, I can vouch for the civic minded and law abiding(otherwise enforced by a police state) nature of the average citizen and overall concern for the environment, fellow citizenry and the generations to come. I see none of it in India – neither the citizens nor the different wings of the government. While growing up, we were taught to live within our means. Similarly, extending the same concept to urban development, sprawl and road capacity, it is glaringly obvious that state RTOs did not pay attention to the state of roads being developed nor simply extrapolate total cars per sqft of road long long ago. They could have easily predicted that more sale of vehicles (4 wheelers) wasnt going to be good for anybody (but good for everyone’s ego!). The traffic police and BBMP have not done enough to predict or prepare bordering on plain neglect and breaking public trust many times over. Other than parts of Bengaluru that were developed by the BDA, everything and anything that cropped driven by extreme greed and lack of foresight has landed us where we are today. It is utterly shocking to drive in streets flaunting BBMP boards at corners…the roads are not wide enough to let 2 cars pass each other – where was planning? What were the planners doing fingers up their you know-what or sucking on their thumb blissfully…while the landowners pillaged? Price per sq meter of road occupied is a fair tax. When enforcement is lacking, taxation will certainly help. Although, I dont necessarily agree with the Robinhood approach – BMTC needs to do a lot more to improve its image, consistency and approach to business. Raising rates will not help, people will abandon and run for exits. To compete with metro, dropping prices, maintaining timely accuracy – even if that means getting the government to congest road space by providing bus lanes and making BMTC as the alternate mode of transport rests on all the parties invloved – RTO, BMTC, BBMP and BTP. Guess who is listening? I agree completely with Mr. Debate. His suggestion is akin to congestion tax enforced in many countries. People will think twice before buying big cars and more than 1 car. I agree with Mr. Devare and feel that some drastic measures need to be taken to reduce the vehicular pollution. The higher tax will only prove to be a partial deterrent. People, for reasons of their own, will continue to buy big cars. All the private cars should be classified into two distinct categories, BIG or SMALL, depending on the Vehicular Area. The usage of the BIG cars should be allowed strictly on the ‘ODD and EVEN’ basis, in the city/ area where the vehicle is registered. This rule should be clearly communicated by the seller, to the buyer when the car- new or used- is sold. Further, the local authorities should issue Number Plates, with a distinct colour for the Big cars so that the offending vehicles are readily identifiable on the CCTV records. Such measures will force buyers either to choose a smaller vehicle or to use public transport on days when their big car will not be allowed on the road. What about other vehicles apart from cars. Won’t they occupy any space on road. Collecting more cash is not a solution . deterrent, people wanting to buy bigger cars will continue to do so even with high tax rates. I have a suggestion. Cars should be classified in to two distinct categories, Small and Big, based on the Vehicular Area. The usage of ‘Big Cars’ should be allowed strictly on the ‘Odd and Even’ basis, in the city where they are registered. This rule should be clearly communicated to the buyer when the car ( new or used ) is being sold. Further the local authorities should make it mandatory for the ‘Big’ cars to have Number Plates of a specified color -different than the ‘Small’ ones, making the offending cars readily identifiable on the CCTV records. Measures like these would perhaps force people to opt either for smaller cars or to use public transport on the days when their cars will not be allowed on the roads. sama and bheda(https://en.wikipedia.org/wiki/Upayas_(diplomacy)) have failed with indian citizenry at large. Even “danda” is not effective because it requires an upright police force (passionate about what they do) to execute. However, danda is prescribed medicine here. Collecting money for the perceived convenience serves as a disincentive. 1 or 2 times is OK, people may pay. How many will pay toll everyday?